An updated version of the UCS Satellite Database is now posted. The new version includes launches through April 30, 2011. The database is freely available and can be downloaded in various formats. 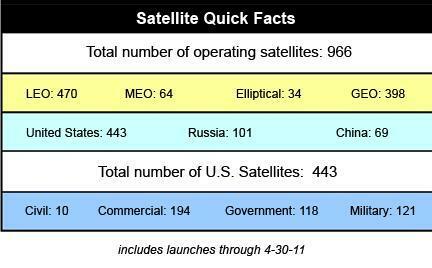 The United States maintains its share of approximately half of all operating satellites, with Russia owning about a quarter as many, and China a sixth as many. Commercial satellites continue to dominate the U.S. fleet (in pure numbers). And actively working satellites continue to be distributed roughly equally between low earth orbits and geosynchronous orbits.